French cuisine is renowned for its decadent desserts and delicious pastries. This 2-hour cooking class at L'Atelier des Chefs in Lyon reveals the secrets behind popular sweet treats such as macarons, éclairs, cream puffs or chocolate soufflé. Under the guidance of a professional chef, you’ll master new techniques and pick up expert tips to give your dinner parties a French flair. Make your own way to the L'Atelier des Chefs cooking school in central Lyon around 15 minutes before your class starts and meet your instructor to discuss the day’s menu. Under the guidance of a professional chef, set to work creating typical French sweets and get hands on as you master traditional techniques, and learn the art of baking the perfect pastry. Menus change depending on the day and season, so you might be making a summer berry pudding, whipping up decadent chocolate soufflés, or layering flakey mille-feuilles. 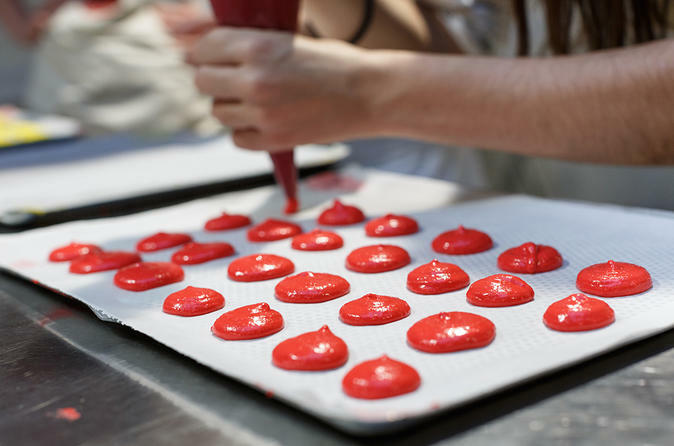 Or perhaps you’ll discover an age-old recipe for classic macarons (brightly colored meringues filled with cream or ganache), or make pastries like éclairs and profiteroles (cream puffs). Along the way, pick up plenty of expert tips and tricks of the trade, to ensure you can recreate your favorite treats back home. Once your class is complete, take the time to sample your creations or pack them up to take away with you. Please note: As this is an authentic French cooking school, the class is conducted mostly in French. The chefs will translate the necessary steps into English for non-French speakers.